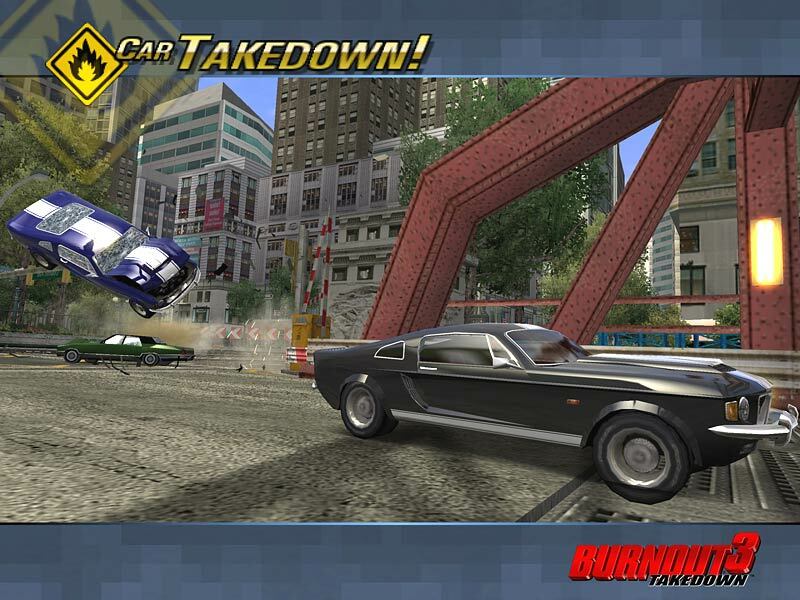 OverviewBurnout 3: Takedown was first in the series to feature the signature takedown system for combating opponents. Revolutionizing the series, it has been the gameplay model for Burnout games ever since. Burnout 3 Takedown was the first game to get the burnout franchise where it is now. The graphics were incredible for the time. The gameplay is excellent and works like it should. The game is very fast paced and features some really good loking crashes. The gameplay also has lots of cars and tracks. If your a fan of racing or crash derby, you will LOVE this game. Burnout 3: Takedown is a racing game which encourages aggressive driving and lets you use your vehicle to smash your way to the finish line by taking out your rivals and causing massive multi-car pileups. The more cars you take out, damage you inflict, the more events and cars you can unlock. Burnout 3 also has a "crash" mode which puts your vehicle at a variety of traffic junctions jam-packed with moving vehicles and pickups to see just how much monetary damage you can inflict. Burnout 3: Takedown continues the racing series with more cars, more tracks, a more detailed crash engine, and a multitude of new gameplay modes for single players, multiple players on one system, and online play. 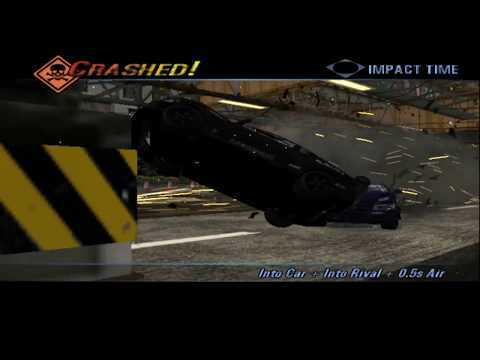 Crash Mode: In addition to this gameplay element introduced in Burnout 2, Pick-ups have been added. They are scattered throughout the intersections. Some pick-ups will halve, double or quadruple your score, cause massive explosions to cause even more damage, or increase your damage with monetary bonuses. Sophisticated crash technology allows for high-speed crashes with extreme detail. Use your vehicle as a weapon and takedown rivals, using the new Aftertouch feature to control your vehicle after the moment of impact. 9 Race Modes including Single Race, Tournament, Lap Eliminator, Burning Lap and Road Rage. Multiplayer Modes include Quick Line, Battle Race, Road Rage, and Party Crash, where 2-16 players participate in a pass-the-controller match-up. 7 Online Modes allow you to race online with up to 6 players. Battle through oncoming traffic in Crash Mode, Single Race, Road Rage, and more. Over 70 Vehicles in 12 different classes including European exotics, American muscle cars, mid-size sedans, sports cars, compacts, buses and semi trucks. Over 40 Tracks spanning 3 continents. Take on opponents across a broad range of environments, and experience dozens of traffic-filled crash junctions. Burnout 3 Takedown is the pinnacle of the arcade racing genre, in my opinion a huge step up from the games prior, offering high speed action with beautifully crafted crashes that still look amazing for a game released in late 2003. There are a couple added race types, such as Crash mode, where the goal is to create the biggest car pileup, by driving head on into packed intersections, and Road Rage, where you have to get the set number of takedowns within the timelimit to get gold. There are plenty of cars to unlock, that are each within a set class so you can choose the right car for the type of event you enter. If you are into 2000 era alternative rock then this game supplies, with a soundtrack that I still love listening to today. This is still one of my favourite arcade racers, and I always end up coming back to it, even 15 years after it's release. Now you can add videos, screenshots, or other images (cover scans, disc scans, etc.) 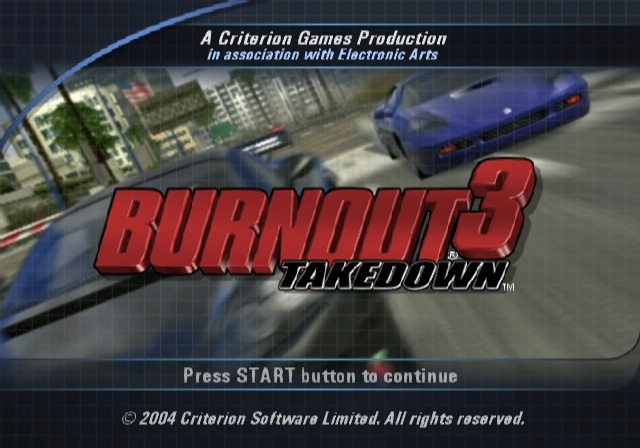 for Burnout 3 - Takedown (USA) to Emuparadise. Do it now!